a hotspot, but we do not have 4g so will just be slow, but better than nothing. the good feature is you can go day by day or month by month. Knowing that telmex installed about 150 more lines for internet and has not increased their bandwidth when everyone comes this year it will be way worse than last year. For instance, I use to have 2 lines that were 10 meg download and they moved me down to 2meg on each so they could do this. I discussed with them, took 3 months of discussions and they moved me to 4 meg each. This is barely video speed without buffering. Went to telcel yesterday to ask about the new internet they are offering. 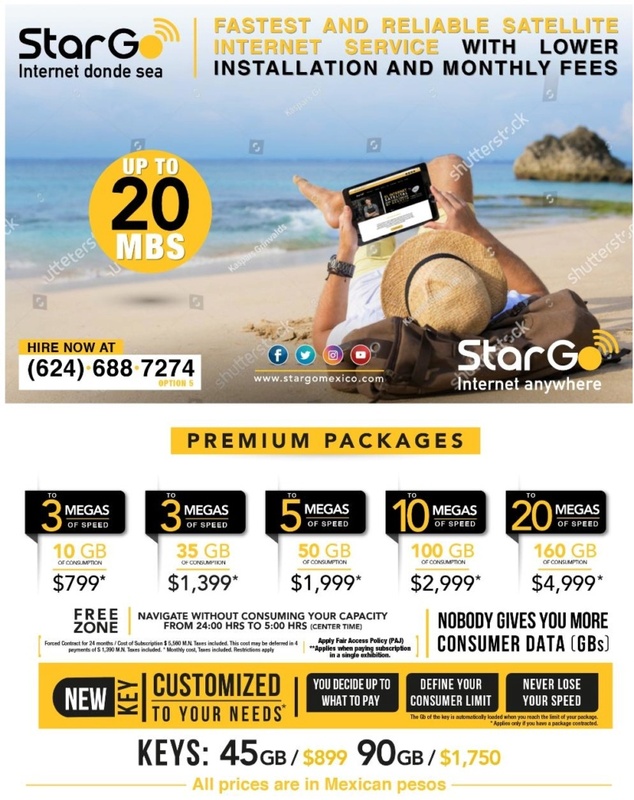 It is 350 pesos a month 2 year commitment and 10 Mbps download for up to 150,000Mb per month usage then you are at 2Mbps after that usage for unlimited. As a guideline stream a video you need 4-6Mbps so after your monthly allowance it is buffering time. Their equipment is 1379 pesos. Here is the big problem, you must be getting 4G signal all the times for it to work. Our tower is only 3G. So not an option for our area. Seems Texmex installing lines with no additional bandwidth is what is occurring. Here is my latest update. 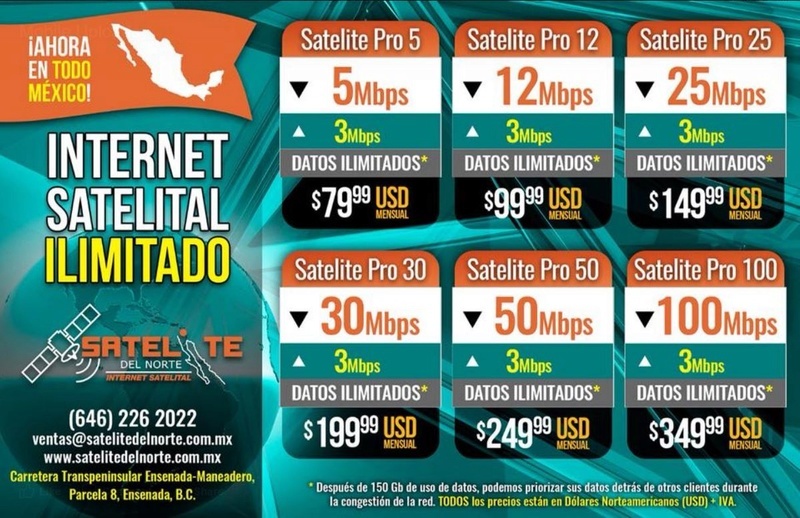 Had a friend (engineer) who installs commercial systems wifi in LaPaz involved in communications call his contacts at telmex yesterday and they have no plans to increase our bandwidth here in LaVentana for at least 2 years at least.... It was an interesting phone call with the technical people of Telmex that he deals with all the time, they were telling him there is no fiber feed in LaVentana. I was telling my friend there is and I saw them near los planes gas station cut into that line and I know the difference between fiber and copper. Interesting that the tech side of telmex is not even aware of it. So nothing that can be done for a long time via telmex for getting us decent bandwidth. So I talked to my Engineering friend who has a commercial installation firm and he can do the same as the other wireless installer that seems to be having some issues here. Nice to have a bit of competition is my thinking. He is willing to start up here if I allow him to use my location as a relay location with me being technical and assisting him with tech issues that he tells me should not make me have to do much very often. He just needs someone here so they do not have to drive here if simple resets are needed. He says he needs me to find 25 people who will sign up for a year about $55.00 a month. He can give us a throughput of 200GB/s, so that is about 8 Mbps downloads a minimum. A person would have to be line of sight from me. So nearly all club ceralvo could work, south beach areas would work. If this works out he will add more bandwidth and expand locations in 2019, a year from now. So please email me if you would be a future potential too with your general area. If there is interest email me do not message me. So basically, you would need line of sight from my place at/near the farmers market for the first group of 25.
dean@mosquitoswithoutborders.com If there is interest I will get the final details worked out with him. I will post the same/similar on the view if here I do not get enough interest. note it appears t is 150g limit becfore they slow you down a month. a service in Barriles area, not our valley. 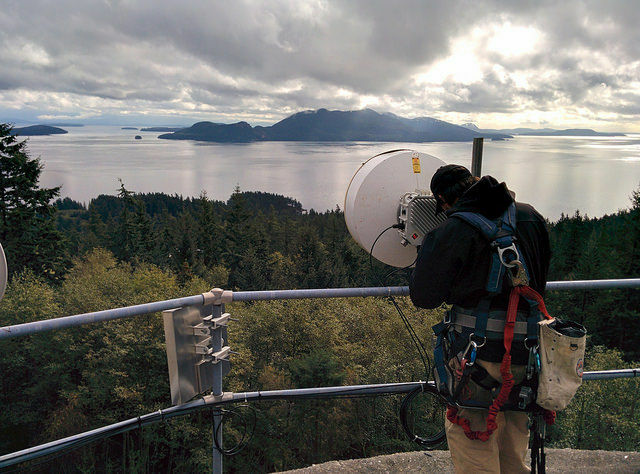 While CenturyLink is the main ISP on Orcas Island, a company owned by Orcas Power & Light Co-op (OPALCO) is building out a fiber network in the San Juan County islands. That company says construction will cost “$1,500 to $6,000 on average” for each home, and residents would be responsible for anything beyond the first $1,500. DBIUA charges much less, but even its low prices “can be significant depending on your income,” Brems said. The DBIUA customers include "lots of retired people and people living off the land. We had to convince people we knew what we were doing,” he said. StarTouch installing a microwave link at the water tower. DBIUA spent about $25,000 in total to build the network, and an anonymous resident provided the money in a 3-year, interest-free loan. Residents paid $150 to become members of the DBIUA and $75 a month for Internet service, which goes toward paying down the loan. The monthly fees also cover the $900 a month DBIUA pays StarTouch for bandwidth. DBIUA needed 25 customers to pay the bills and stay afloat. At 50 now, the organization is paying the loan off a bit more quickly. Sutton hopes to lower the monthly price residents pay after the loan is paid off. Explanation: 1 Kbps (kilobits-per-second) = 1,000 bits per second and 1 Mbps (megabits-per-second) = 1,000,000 bits per second. A lowercase "b" in Kbps means bits, while an uppercase "B" means bytes. There are eight bits in a byte. For comparison, most people here are on the minimum Telmex subscription (1 Mbps) so the minimum offering above is nearly 3 times faster. Loreto and Mulege Satellite TV, Internet and Cell Phone Booster Services - Offering quality installation and repair services for Dish Network, Shaw Direct Satellite TV, HughesNet and commercial V-Sat Internet systems, wired and wireless home networks, VoIP telephony, home theater and structured cabling. Also offering Cell Phone Boosters! If you're tired of dropped calls, I can help. Through a special partnership with El Dorado Networks in the US, we offer Cell Booster Technology that works with TelCel, Nortel and Movistar. Installation and Repairs For Satellite TV and Internet - I can install, repair and upgrade your Dish TV, Shaw Direct or HughesNet antenna. Need Service For Your Dish TV, Shaw Direct, or Hughesnet Internet System? If you need service, I can help you. Whether you need a new receiver, parts, a new dish or cables, or just a repointing to get you back online or restore your TV or Internet service, call me at 612 104 2000 or send an Email to todossantostv1nnnngmail.com.